In North America the Indian Country expands in the Southwestern states, Arizona, New Mexico, the southern parts of Utah and Colorado. Here are the largest Indian territories in the United States, the largest Indian reservations, the Navajo, the Hopi, the Apache and a lot of smaller tribes condensed in a relatively small area. Further, in Middle America the Indian Country continues with the amazing Aztec and Maya ruins, and in South America with the ancient Inca town, high above the sea level in the Andes, the magnificent Machu Picchu. The following locations are some of the highlights of the Indian territory. Montezuma Castle National Monument contains ruins of an early cliff dwelling. Built in the 12th and 13th centuries, it is among the best preserved dwellings of its type. The five-story castle, believed to be inhabited by Sinagua Indians, contains 20 rooms and was once accessible only by ladders. 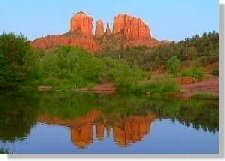 Sedona is situated amid the red-hued rocks of Oak Creek Canyon in Arizona. Overlooking Oak Creek, the monoliths and buttes provide a startling contrast to the surrounding lush vegetation and forest. Sedona is purportedly home to several vortexes, electromagnetic energy fields emitting upward from the earth. These positive fields of energy are thought to energize and inspire people. Sedona and Oak Creek Canyon is a sacred place for the Indians of the area. The Grand Canyon of the Colorado River is one of the world’s most outstanding spectacles. The canyon is 277 miles long and averages 10 miles in width from rim to rim. The western portion of the canyon includes the broad Havasu Canyon, part of the Havasupai Reservation. Some 250 tribal members of this small agricultural tribe still live in the canyon. The geological aspect of the Grand Canyon is of great scientific importance. At no other place in the world is such a vast view of time displayed so clearly. Each stratum of rock distinctly marks a period of the Earth’s history from 2 billion to 250 million years ago. The Grand Canyon, as a negative vortex, is a sacred place for the Indians of the area. A colorful region covering several thousand square miles, Monument Valley Navajo Tribal Park lies within the Navajo Indian Reservation in Arizona and Utah. The park contains Mystery Valley, where isolated monoliths of red sandstone tower as much as 1,000 feet above the valley floor. Spanish, American Indian and Anglo influences mingle yet remain distinct in Taos. Taos proper - legally Don Fernando de Taos - is the original Spanish town that is now a center of art and tourism. Pueblo de Taos (San Geronimo de Taos), home of the conservative Taos Indians, remains as it was before the Spanish conquest. Ranchos de Taos is the farming community; its mission church is one of the most frequently depicted structures in the state. Culture plays a very important role in the city’s life. The Taos Society of Artists is noteworthy for the distinctive mark it has made on art in the United States. Santa Fe is the city where opposing strands of the enduring weave of New Mexico converge. American Indian, Spanish and Anglo cultures, church and state, past and future remain unmerged but firmly linked in Santa Fe. As these differences are the essence of the state, they also are the soul and charm of its capital city. The link with the past is particularly strong. Excavations regularly unearth relics of unknown age; modern technology is merely window dressing on the efficient architectural designs devised by the Pueblo Indians in the first millennium. In the rugged canyon and mesa country of northern New Mexico, Bandelier National Monument lies 50 miles northwest of Santa Fe. Remnants of an Anasazi community established 7 or 8 centuries ago include pueblo and cliff ruins. The most accessible ruins consist of cave rooms hewn out of the soft tuff rock, houses built on the talus slopes and a circular community village. Mexican pyramids did not necessarily resemble the familiar form of the Egyptian variety. Created essentially as religious monuments, they frequently had steps built into the sides. Exterior carvings not only served as decoration but also depicted historical and mythological events. The ceremonial centers from which these pyramids rose were dedicated to fanciful gods and paid tribute to the priest rulers who presided over rigidly hierarchical societies. Teotihuacan, northeast of present-day Mexico City was a ceremonial center. The remains of a great Maya city, Chichen Itza is the Yucatan Peninsula’s best known and most visited site and one of the archeological wonders of the world. High in the Andes the Inca erected what is probably the most spectacular work of engineering in all of ancient America. 2,000 feet above the valley of the Urubamba River rises the ancient city, Machu Picchu. Machu Picchu’s architecture testifies to the ingenuity of its builders. In 1911 the US archeologist Hiram Bingham rediscovered the mountaintop after a long period of silence and brought to light the most completely preserved Inca city left in Peru.